So as you all know I have been working on my nanowrimo book for the last 8 days and I am happy to report I just finished my 27,350th word. That means I am over half way done and it is just day 8. I am really proud of my dedication and hard work and can’t wait until it is finished. The bad part is I am not loving my book. I really don’t want anyone in my writing group to read it and haven’t wanted to post new sections because I know it isn’t great. It certainly isn’t nearly as good as last year’s book and I’m not saying that was some kind of masterpiece. Then again it is the first time I have ever written fiction so maybe I am being too hard on myself? Have any of you guys had this happen when you are writing nanowrimo, where you just become kind of disillusioned with your story? It is a bit hard to sit down and write everyday but I set a goal and I am going to finish. I really think my story will be better as a screenplay because you can more easily show a person talking in another person’s body. That is really hard to do in a novel. It’s too bad Script Frenzy ended last year 😦 I do much better when I have a group challenge and am not just dependent on myself for motivation. After about 10 minutes in the hospital Marnie could feel the shot start to kick in. She could move her back and neck but now the problem was she couldn’t think clearly. Everything was muddled and cloudy inside and the world felt like it was spinning. She didn’t know where she was, who’s body she was in or what she was doing. “Uhhh…no that doesn’t sound nice and I’m doing just fine” said the nurse inching away and chuckling. “She also gave me her 4 children and took my quiet apartment and especially at Christmas. Why did we have to be switched at Christmas? Isn’t that mean? I could keep the kid (they really were quite cute kids and she felt like she could talk to all of them, deal with them), but I miss my cat. Her name is Pepper. Do you have a cat doctor?” she says with a bit of drool coming out of her mouth. “Because I told you silly- she took my body and gave me her children” with that Marnie began to get off of the exam table. “I took her body but it has a bad back. Otherwise I like it just fine and she doesn’t have to go to work but gets to spend time doing something important. “ she says with a slur. “Of course he can” she says “he’s Santa. He can do whatever he wants. What do you want for Christmas? You should ask him now why you have the chance. Did you know that Rudolph actually has a red nose and flies? I’m tired. I feel like you are made of glue and all clear inside. Am I clear like that?” Marnie interrupts. “Honestly I want a night off to relax” says the nurse. “Is that so?” The nurse looks truly mystified even for someone on a muscle relaxant shot this is unusual. Not wanting things to get any more out of hand I jump in. “Ok. Let’s go” I can’t help but laugh at the half dazed conversation attempts made by poor Marnie. This really was a new side of her that I don’t think anyone had seen. “How did you know about Spencer the elf?” I say with surprise. That’s what inspiration is. It’s seductive and thrilling, but you can’t depend on it to call you. It doesn’t work that way. The good thing is, inspiration is irrelevant to whether or not you finish your book. The only thing that determines that is your own sense of discipline. Here’s what happens when I sit down to write. First, I turn off my access to the internet by engaging Freedom. 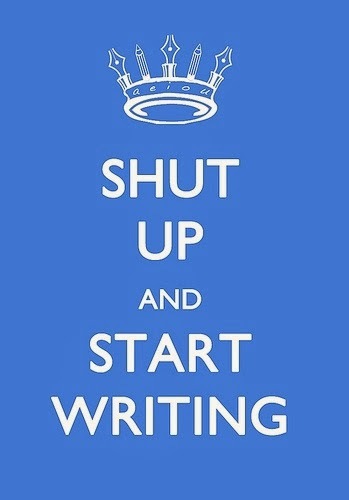 (The internet is the number-one killer of writer productivity!) Second, I open Scrivener. (Substitute whatever word-processing program works for you.) Third, I force myself to sit there with my work-in-progress until Freedom says I’m done. (I always set it for at least one hour, and often three.) I don’t allow myself to get up to make endless cups of tea (one will do). I just sit there. That’s all. How often am I filled with inspiration before I start writing? Pretty much never. Instead, I usually stare at my work-in-progress with a vague sense of doom. I often think to myself: What the hell am I doing in this scene? I don’t understand how to get my characters from Point A to Point B! I really want to check Twitter! The trick is this: As long as I sit there with my work-in-progress, at some point I will write something, because there’s nothing else to do. Whatever I write may not be any good, but that doesn’t matter. When you’re writing a first draft—which most of you are doing this month—the most important thing is to keep moving forward. Your first try will be riddled with mistakes, but that’s what revision is for. Right now, you only have to put those ugly, wrong words on the page so you can fix them later. “The trick is to write something”. I really like that and it is exactly what I am doing. I am writing something and I will make it better and work on my 1st book even more because believe me it had much more inspiration. I know it isn’t the greatest book ever but I sincerely love it and want to make it as good as I possibly can. 22650 words left and I’ll be done! So excited. How are you guys doing on nanowrimo and what do you do when you stop loving your manuscript? Do you just give up on it or finish? Thanks in advance for your insight. I have news: Anything that gets written at the speed of 50,000 words in a month isn’t going to be “very good,” NaNoWriMo or not. Not even if the writer is a famous “published” author with dozens of titles in every brick-and-mortar and virtual bookstore in this arm of the Milky Way Galaxy. So the writerly “guidance” you often read that insists you’re not a real or serious or good writer if you’re not churning out another NYT Bestseller in time for every monthly payment on your Maserati, is pure, unadulterated cat dirt. My first novel was not a NaNoWriMo. I got the initial 45,000 words written (longhand) in 6 weeks, but it took me two weeks shy of three years to close the last plot hole. There were plenty of times during the first year that I thought, Where is this drivel coming from? But then I had an epiphany: that I was writing badly better than the last half-dozen wretchedly written novels I’d read that had been professionally published by any of the Big Five traditional publishing houses. Then and there, I decided that I was going to grow up to be The Best Bad Writer in the West, and by golly, I did. And from that time forth, I had a hoot doing it, too. Thanks so much. I am sure you are right. It’s years in the making to write anything. I like that Malinda Lo said about just writing each day even if you aren’t super inspired. Getting it done. I guess it’s different than last year because I felt so inspired. It had been a book in my head for 4 years and it just came. I’m not saying it’s great writing but it did come easier. (I say that and I’ve written nearly 30k in a 8 days so I shouldn’t really talk. It’s just been different experience from last year so that’s all). Nanowrimo is still more fun than I ever would have expected. It feels good to just get it on the page but I think my writing is stronger when it comes from my life at least tangentially but its a good learning experience. Love the quote “Then and there, I decided that I was going to grow up to be The Best Bad Writer in the West, and by golly, I did. And from that time forth, I had a hoot doing it, too. ” Wear it with pride sister! Joy in the journey right? So, when you have the opportunity to haul my 1 1/2-lb, fluffy-meets-gritty, five-genre romance novel to the lake, and your friend says, “What’s that you’re reading? This is the first time I ever saw anybody use a winch to get a book out of her beach bag,” you can say, “It’s ‘Irish Firebrands,’ by the Best Bad Writer in the West. We’re blog buddies.” Just don’t drop it on her foot when you hand it to her. Ha! I will tell my family over the holidays! Did I ever tell you I got your book off amazon at the beginning of October? Will read. I promise. I am so impressed by anyone who has written a book. Much obliged! Say, would you do me a favor? Look in the back of the book, probably on the very last page, in the lower right corner, and tell me if it says SC, or KY. Thanks! I’ve a few more quick questions about your purchase. Please contact me: irishfirebrandsatgmaildotcom. Thanks!